Low-profile PCR plates are recommended for newer thermal cyclers, real-time systems including fast PCR systems and DNA sequencers. Instrumentation compatible with low-profile PCR plates include Bio-Rad’s C1000 Touch™ and S1000™ Thermal Cyclers and the CFX series real-time PCR systems. Use the PCR Plastics Consumables Selector Tool to determine individual plate compatibility with other instruments. Several types of low-profile PCR plates are available to suit different needs. Hard-Shell® Low-Profile Skirted and Semi-Skirted 96-Well PCR Plates, including Hard-Shell plates for the Roche LightCycler 480, feature a patented* two-component design engineered to remain warp-free, permitting precise positioning for automation, and have black lettering for easy identification. Hard-Shell plates are compatible with heat, pressure, and adhesive sealing. Multiplate™ Low-Profile Unskirted 96-Well PCR Plates are made of polypropylene for low protein binding and are easily cut with scissors if less than a whole plate is needed. Concord™ Polycarbonate 96-Well PCR Plates are breathable plastic, so reaction volumes should be ≥ 20 µl. As they do not have raised rims, Chill-out® Liquid Wax is the best sealing option. 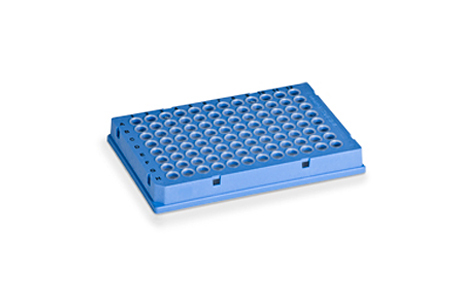 Microseal® Low-Profile Skirted 96-Well PCR Plates are single-component polypropylene plates with locator holes and flat vertical sidewalls for secure handling and easy bar coding. The footprint and well spacing meet ANSI/SBS microplate standards. Raised rims provide compatibility with most sealing systems and a tight seal.